Once upon a time, the small London suburb of Putney had four cinemas running concurrently. Only one remains, the others having been slowly washed away by the growing dominance of the major chains and the lure of home entertainment. Normally I’d mourn the loss of these singular, historic venues, but in this instance all I can think about is how much I wish ‘the decline of cinema’ had gone the whole hog and left Putney theatreless. 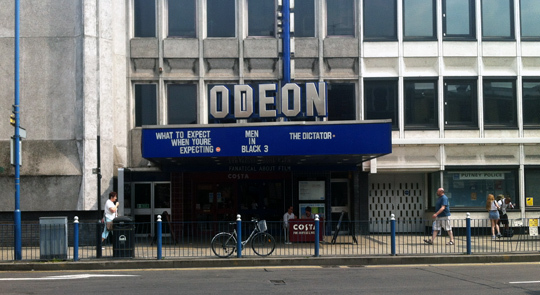 I made my first trip in over two years to the Putney Odeon last night, and despite a renovation that’s basically converted it into a Costa Coffee with a small Odeon concession, it’s still holding tight onto its reputation as The Worst Cinema in London. I shudder to think what their locations outside of major cities must be like. Broadly speaking, I am against film piracy. After all, this blog survives thanks to revenue streams intrinsically linked to the film industry. And yet, I cannot in good conscience object to the illegal distribution of Hollywood movies while the Putney Odeon continues to operate in its current state. In fact, I can see no other course of action but to publicly endorse such a practice. I’m afraid it’s the only way they’ll learn. I await an official response.